The newspaper industry was, in many ways, was the news sector hit first and hardest by the advent of the digital age. As readers began to move online, papers were still producing strong profit margins with the vast majority of revenues tied to their legacy product. So, for the newspaper industry—culturally more tied to content creation than to engineering, change came very slowly—if at all. Within a few years, the industry found itself far behind the technology giants—and behind their readers’ changing news habits—in shaping the future of news. Since then, the pace of change has only accelerated. . While the industry has finally begun to experiment with new revenue streams as well as new ways of creating content and engaging with audiences, the numbers are far from reassuring. 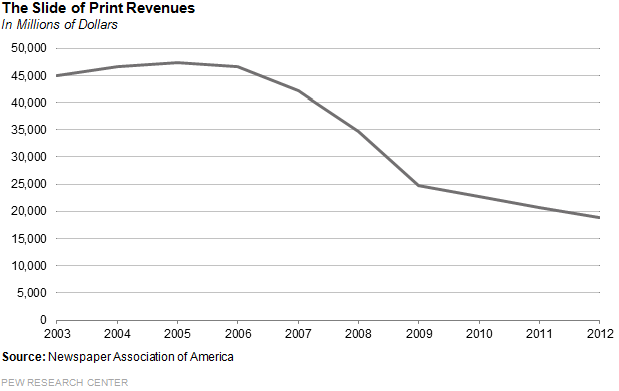 Total advertising revenue for the newspaper industrywas down 6.8% for the year in 2012. That was led by declines on the print side for the seventh consecutive year, and not just by a little. Print ad revenue dropped 8.5%, or $1.8 billion, even as the economy had seen slow improvement. Print advertising is now just 41% of what it was in 2006. Digital ad revenue, meanwhile, has grown at only anemic rates that last two years (up 3.8% in 2012) and currently accounts for only 15% of all newspaper ad revenue. Online ad growth, then, is far from making up for print losses. 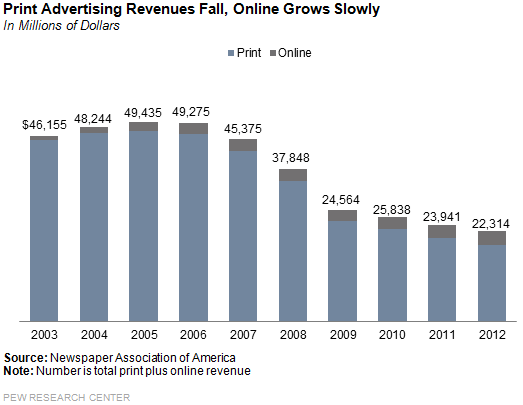 Indeed in 2012, for every digital ad dollar gained, 15 ad dollars were lost in print. 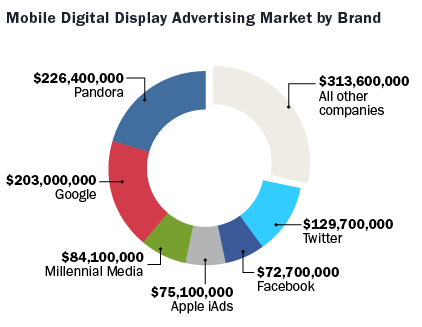 That is worse than the 2011 ratio of 10 print ad dollars lost for every one ad dollar gained in digital. Two developing ad revenue areas that seemed to hold promise for news even a year ago may already be moving out of reach. Overall mobile ad revenue is growing rapidly – 80% in 2012 – but as with digital ad revenue overall, it may be a bust for the news industry as technology giants like Google and Facebook move in to harvest that money. Fully 72% of mobile display ad revenue now goes to six companies—none of which are news producing organizations. Facebook didn’t even operate in the mobile realm until the summer of 2012, but already mobile accounts for 30% of its ad revenue. And, Google alone is now the ad leader in search, display and mobile. Local digital advertising, a critical ad segment for news, is also growing— at 22% in 2012, according to Borrell Associates. But two major trends may be pushing that revenue out of the hands of local news organizations. One is the more sophisticated geo-targeting by major national ad networks, which appeals to national brands like WalMart. In addition, Google, Facebook and other large players are improving their ability to sell ad space to truly local advertisers. Circulation revenue improved somewhat in 2012, up 4.6% for both weekday and Sunday editions, led by both higher newsstand prices and broader adoption of digital pay plans. One emphasis at many papers has been to reinvest in print and particularly in the Sunday edition of the paper. The circulation revenue gains are starting to balance out what has been the decades-long heavy reliance on advertising in the newspaper industry. 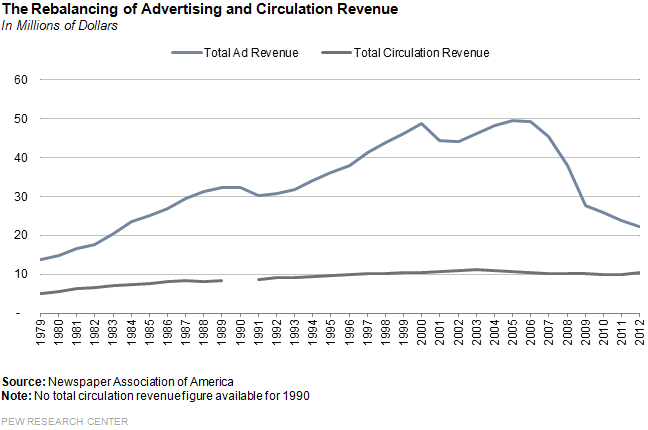 But at this point, that rebalancing is more likely a reflection of the decline in ad revenue than strong growth in circulation. In the last year, newspapers—keenly aware of the shortfalls in advertising dollars– began experimenting with new ways of financially supporting their operations. By 2013, more than 450 had adopted or were in the process of adopting digital pay plans. The Washington Post, long a holdout, joined the movement in June 2013. There are some early signs of revenue gain, but the numbers are still small for most. 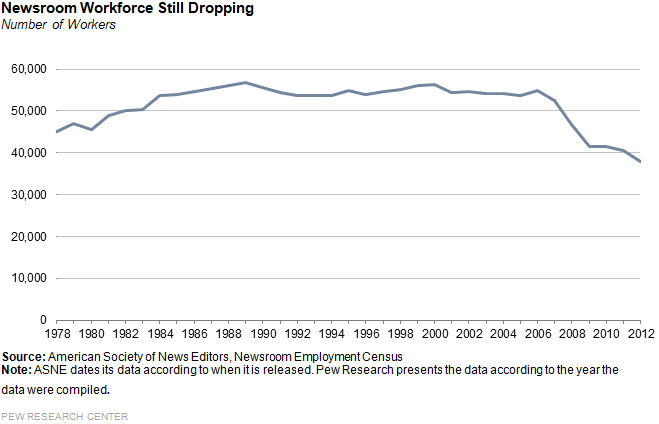 Meanwhile, as newspaper budgets have shrunk, newsroom staff declined as well. Full-time professional editorial jobs at daily newspapers declined another 6.4% for the year, leaving the industry below 40,000 for the first time since the American Society of News Editors began taking the newsroom census back in 1978. Thus far this year, the cuts have continued. In July, The Cleveland Plain Dealer announced that it was cutting a third of its staff, the Oregonian announced in June that it was cutting 45 newsroom staff and the Chicago Sun-Times let its entire 28-person photo staff go in May. It is too early to tell what the sale of The Post to Bezos will mean for the staffing of The Washington Post or for the journalism it produces. Bezos has asked both publisher Katharine Weymouth and executive editor Marty Baron to stay on and they have agreed. Whatever business strategy emerges from the new owner in the future, readers are most likely to focus above all on the quality of The Post’s editorial product—in whatever form. Are Sirius and XM Headed for the Altar?